Why choosing a MineralPro Water Filter is your best bet for safe drinking water! 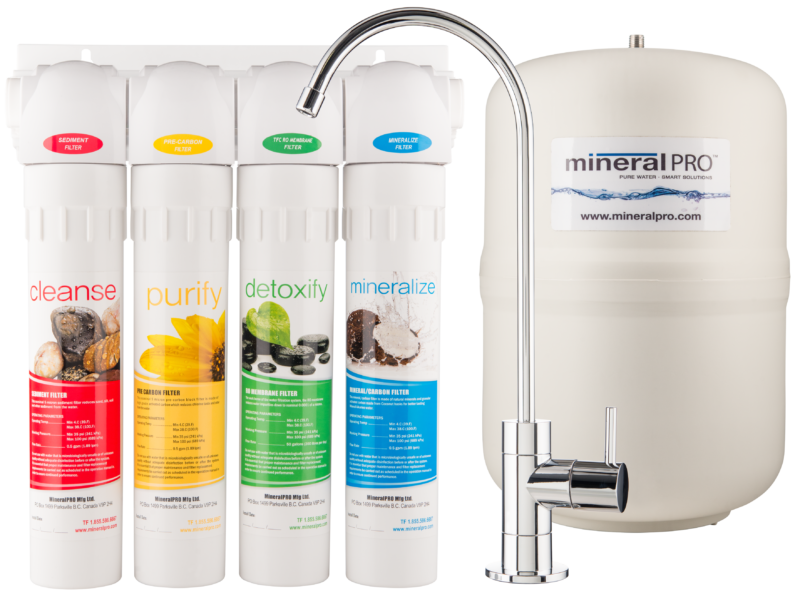 What makes MineralPro Water Filters the best on the Market? MineralPRO Systems are made with the highest quality components, the best design and by far the safest, best tasting water you can get. Many people tell us they could not live without our water; many fill their bottles to take to work and to have available wherever they go! MineralPRO systems use only John Guest Fittings and tubing. Why John Guest? John Guest are by far the largest and best manufacturer of small diameter tubing and fittings in the world. They are sold in most countries and have approvals from just about every testing agency in the world. Why is this important? Fittings are by far the biggest failure in all water systems. Most companies use cheap replicas of John Guest fittings which have higher failure rates. MineralPRO has never had a tube or fitting failure. When tubing and fittings fail, they typically cause water leaks and can result in severe damage to your house. MineralPRO uses the highest quality “Food Grade” plastic RO Storage Tank while most other companies use a steel tank. Why is this important? Food grade plastic will not leach any by-products into the water, nor will it rust as the metal tanks do. RO systems remove all the minerals from the water resulting in very acidic water that will leach minerals from tanks and piping when this water comes in contact with any metal. Many plumbing jurisdictions do not allow water from an RO to be run through a metal pipe for this reason. The MineralPRO tank has the smallest footprint with a diameter of only 9” and slightly taller than most resulting in using less floor space under the sink. Why is this important? People value every inch of space under their sink for cleaning products, recycle bin, garbage bin, and many other items. Every filter used in the MineralPRO system is “air-tested” at the factory. Why is this important? By air testing these filters, we eliminate any potential failure of the filters which in turn could result in leakage of water. Our filters also have a double O-ring seal ensuring positive sealing and no leaks. MineralPRO has never had a filter failure. MineralPRO systems are designed for easy installation and come with very clear, well-illustrated instructions anyone can follow. We pre-build the systems at our facility with most of the fittings attached and the tubing connected and labelled, identifying where each goes. We have tried to make it as simple as possible and eliminate the ‘fear of failure’ people have when contemplating plumbing projects. MineralPRO has a ‘Fourth Generation’ licensed plumber on staff 24/7 to answer any and all questions you may have. Some customers send pictures of their existing plumbing so that our plumber can advise the best solution for installation or troubleshooting – how many companies can offer that level of service? Easiest Filter Replacement of any device! MineralPRO has the easiest filter replacements of all systems. The system does not need to be turned off to replace filters; simply swing the cartridge away from cabinet wall at a 45 degree so you can get an easy grip on it, turn the cartridge to the left a quarter turn, and the cartridge slides out. Insert the new cartridge and turn to the right a quarter turn to lock in. That’s it! How easy is that! Nothing to sanitise like other systems; no cleaning, no mess! MineralPRO systems have built-in shutoffs in each stage allowing you to remove any filter without shutting off the water. You can cut the filter in half, dump out the components and re-cycle the housing or mail back it to us and we can do it for you. The carbon and mineral filter components can be added to your compost. One of the best features of the MineralPRO system is the “Mineral Stage”. This stage has natural minerals required for optimal health benefits such as Calcium, Magnesium, Potassium and many trace elements. Why is this important? Most of our mineral intake comes from the healthy food we consume, but many people with their busy lifestyles do not always eat a healthy meal and are not always getting all the minerals they need. By adding minerals in our water, we are getting extra minerals in our diet which can help on the days where we do not get enough from our food intake. The best part is that when we add minerals to the water, the result is very healthy “ Mineral Alkaline” water because minerals raise the pH level to a higher range. Not only is this very healthy water, “Minerals” are what give the water the great taste! Why is this important? When water tastes good, we tend to drink more, an obviously good thing! Many mums have said their kids drink more of our water -less juice and pop- because it tastes great! How do these minerals get in the water? Ours is a natural process just like water flowing down a mountain stream. When water flows down a mountain stream the minerals that the water passes over get absorbed into the water ‘naturally’. The MineralPRO Systems works the same way. Our system stores the pure RO water in the storage tank after the purification stage and when the faucet is opened this clean water flows through our last stage which has the minerals in it. The water passes through the mineral bed, and these beneficial minerals get absorbed into the water. The final component in this cartridge is carbon made from ‘coconut husks’; the purest form of carbon. Why is this important? The coconut carbon puts a final polish on the water and gives it a great, clean, healthy taste. The water goes through this last stage just before it comes out of your faucet, so it always has this great fresh taste, never a ‘stale’ taste from sitting in the tank. MineralPRO has just re-designed the RO and UF systems and added some new exciting features and benefits. The RO membrane is now “ Eco – Friendly”. What does this mean? Our system now uses less water to clean the RO membrane which saves water and improves the life of the filters because of less water flowing through the cartridges. Our “Mineral Stage” now has more minerals in it resulting in a higher pH (more alkaline, higher mineral content) and even better tasting. We are now pre- connecting the tubes and fittings making it even easier to install. MineralPRO believes all of our customers, new and old, should enjoy these additional benefits. We, therefore, decided to offer these new replacement systems “free” to all of our existing customers so they could share in our excitement of these “new systems” When was the last time you were offered a “ free upgrade”? Cheaper offshore systems are available in some of the big box stores, but none can compare to the MineralPRO System with all the above features and benefits. We stand behind our products and ensure our customers are fully satisfied with our products and ensure they can always get help, support and whatever parts they may need in the future. We look forward to talking with you soon!